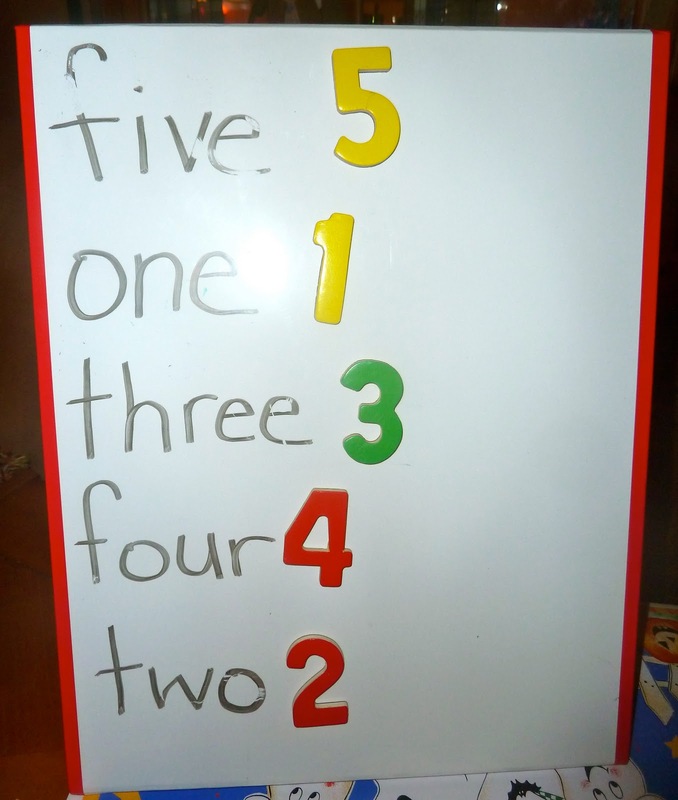 Over the past two weeks our sight word focus has been on color words and the numbers 1 thru 5. Aside from our usual sight word activities the Lil Divas had fun playing some games that reinforced the words. 1. I made some construction paper crayons that matched our target color words and put a small piece of magnetic tape on the backs. 2. 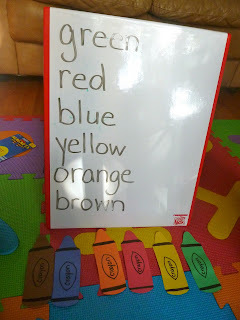 Using our magnetic dry erase board I wrote our current target color words. 3. The Lil Divas had to match the crayons to the correct color words. Our 2nd color match game was a huge hit & it was so SIMPLE! The Lil Divas played over and over again, until I finally had to stop them so we could move on! I wrote the color words on index cards - mixed them up and spread them out on the floor. On the count of 5 the Lil Divas ran to a card, read the word and then had to go in search of an item that was that color! Then, we moved on to the number words. I had the girls work on the magnetic board, this time using our magnetic numbers. Then we had a Number Hunt! I rote the number words for numbers 1 thru 5 on index cards, mixed them up and placed them on the floor. The Lil Divas had to read the number aloud and then go out in search of items that would fit accordingly. The Lil divas loved reading the words and running around the house in search of items to match them! They loved it so much we did it to practice their spanish. I called out a color or number in spanish and they had to find an item(s) to match it! FUN! 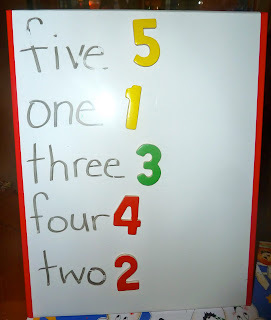 Love this idea of matching color words w colors and number words w numbers. Gonna have to make this activity. I can't think of who sings the songs, maybe Greg and Steve, but they have songs for every color word. 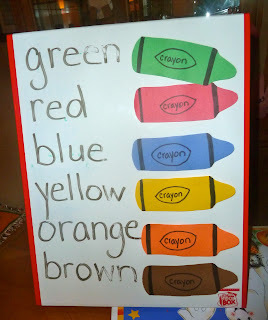 They are set to the tune of easy kid songs and my students love them and it helps them remember the color words. There is also one for the numbers. Google it! I love this post, so colorful and informative! I especially like the squishy floor mats. I have never seen these before. Your girls are adorable! Great activities! I love how they allow your girls to be so active too. Those are my favorite sort of activities. I am in love with the crayon color matching!!! Such an awesome idea!! Love these ideas! They are so simple but so effective! And they look like a lot of fun! Love this! THanks for sharing this over on my mommy solution meme. I shared a link to this over on Facebook. the color orange in spanish should read "ANARANJADO". Naranja refers to the orange fruit. the color brown though not incorrect, it should read "CAFE" as that is most commonly used.